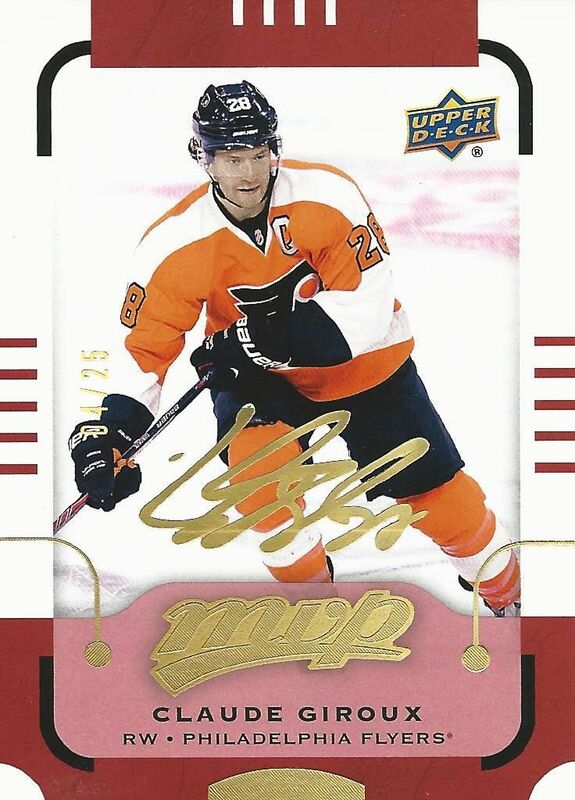 The highest end sets from 2014-15 haven't been released yet, but Upper Deck has gone ahead and given collectors the first set of the 2015-16 season... MVP! Last year MVP returned to it's stand alone set form and gave collectors a nice lower-end set to collect. I'm curious to see how Upper Deck has improved upon the cards this year. Upper Deck does a great job of making their sets hold true to their brand. The design of the MVP base cards is instantly recognizable as an MVP card. 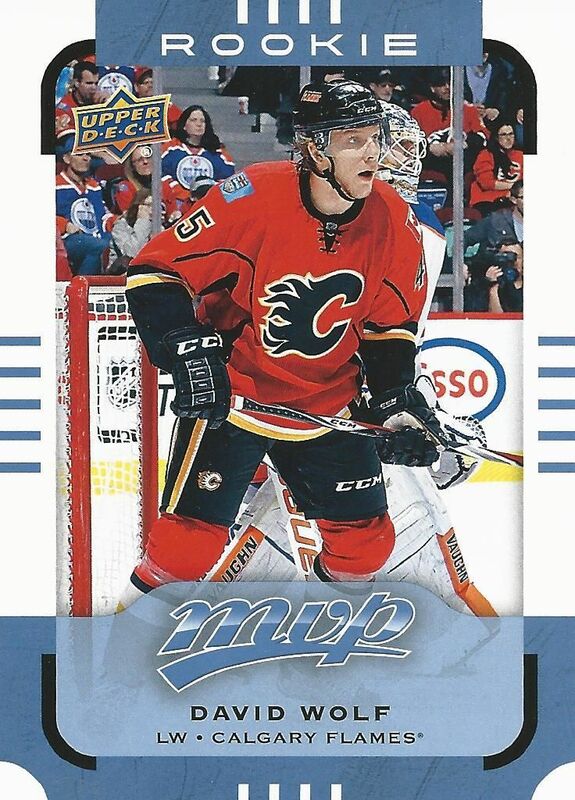 Even if you removed the MVP logo at the bottom of the card, you would know it was from the MVP family of card sets. The base card has a relatively thick outer border that contains golden colored elements. 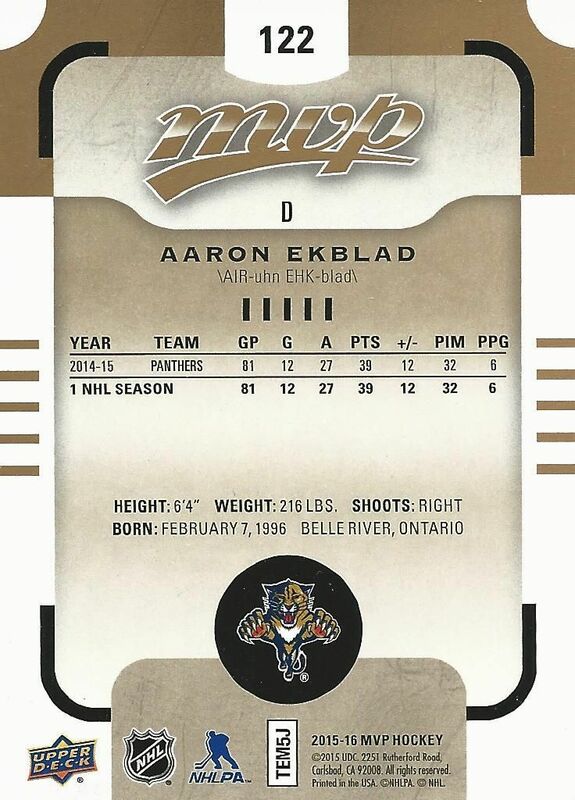 The bottom portion of the card is also covered mostly with the MVP logo and player information. This leaves less room for the player photo. I guess that's ok because the photos used in MVP are of the boring variety. Going through the cards you see just your standard NHL photo of the player on the ice. There isn't anything too visually interesting to note here. It's pretty much your standard low-end card without much going on. It may be an easy beginning for new collectors to put together, but I'm not even sure why a set collector would want to assemble the base card set. The backs of the base cards are as humble as the fronts. These backs don't even get a player photo, just the team logo. The back reminds me a little of how Panini used to do their backs - simple with no frills. On a positive note, the backs gel with the front very well as they share many of the same design elements with each other - this makes for a nice and uniform card from front to back. 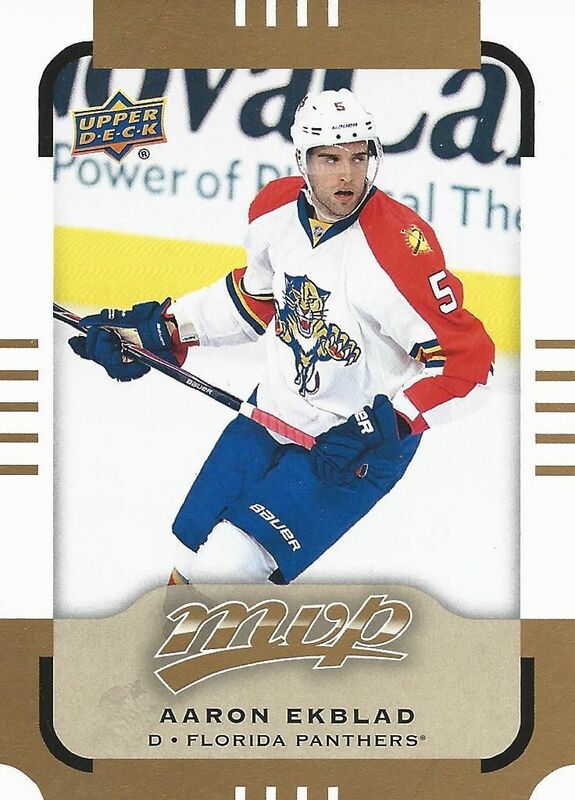 Rookie cards are distinguished by their icy blue replacement of the base card gold elements on the front and back. They also have the word 'rookie' at the top to help collectors know that they have a first-year card. I actually think this color scheme is pleasing, and prefer it quite a bit to the standard base card. A box of MVP will give you 24 packs to open up. It's definitely nice to rip open a large amount of packs like this on occasion. MVP is filled with parallels, inserts, as well as the opportunity to pull memorabilia cards and autographs. Back this year are the Colors and Contours insert cards. These cards are parallels of the base set done with shiny foil and aggressive die-cutting. There are many different levels and variations on these cards, so its important to check the back of the pack to see how difficult the card you find from this set is to get. 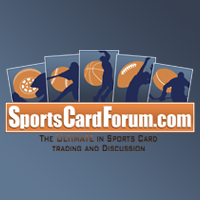 The Colors and Contours cards are very nice to look at and will be appealing to collectors who enjoy cards that have a busier look to them. These base parallels are basically the extreme opposite of their standard base counterparts. There's nothing boring or standard here! 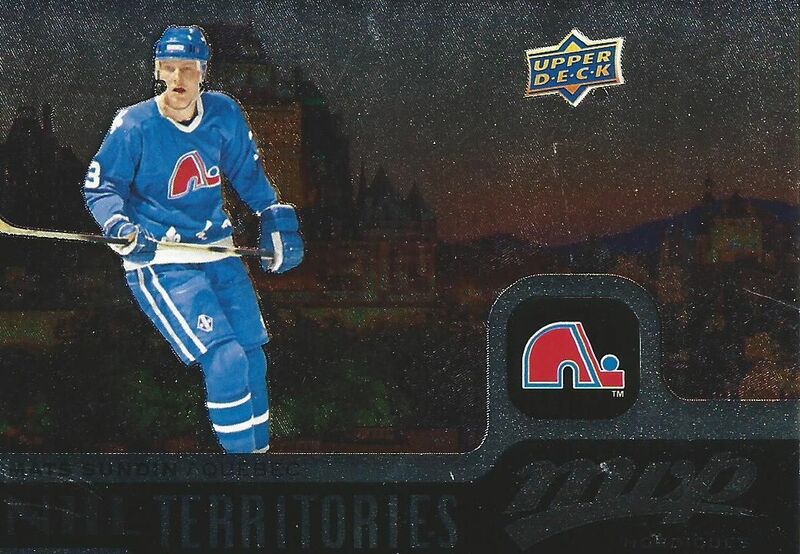 NHL Territories are foil insert cards that have a player set against an NHL (or former NHL in this case) city's background. I am always a fan of cards that feature the actual city the player plays in, so these cards have an instant appeal with me. The design is done well as the foil really helps the background to pop with color. 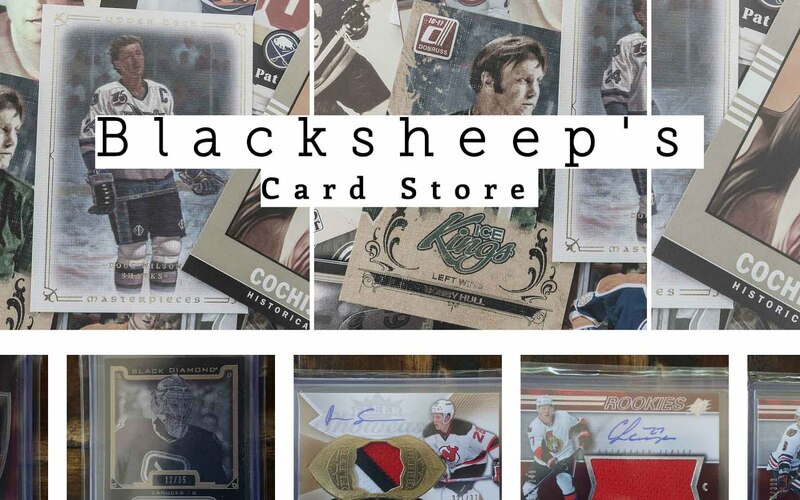 Both memorabilia and autographed versions of these cards are available for collectors to find. Silver Script parallel cards come one in every three packs or so. These cards add a nice silver foil embossed signature and other silver foil touches to the card. Like I always say, these Silver Script cards would make great regular base cards for the MVP set. Super Script cards numbered to just 25 are also available to be found in MVP this year. These cards add a rainbow gold foil to the card as well as serial numbering to just 25. Super Scripts type parallel cards used to be extremely popular for collectors to find. Now they are nice pulls, but they don't entice collectors like they once did. 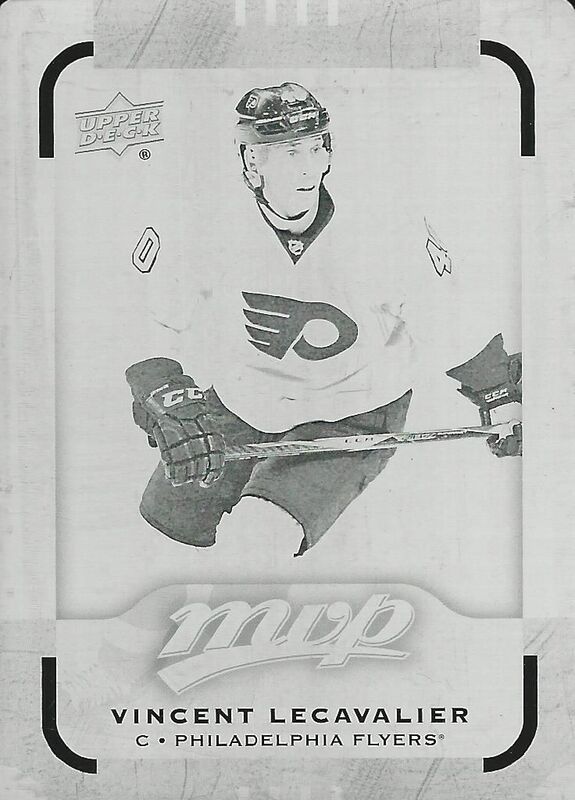 The surprise of my box was this one-of-one printing plate of Vincent Lecavalier. 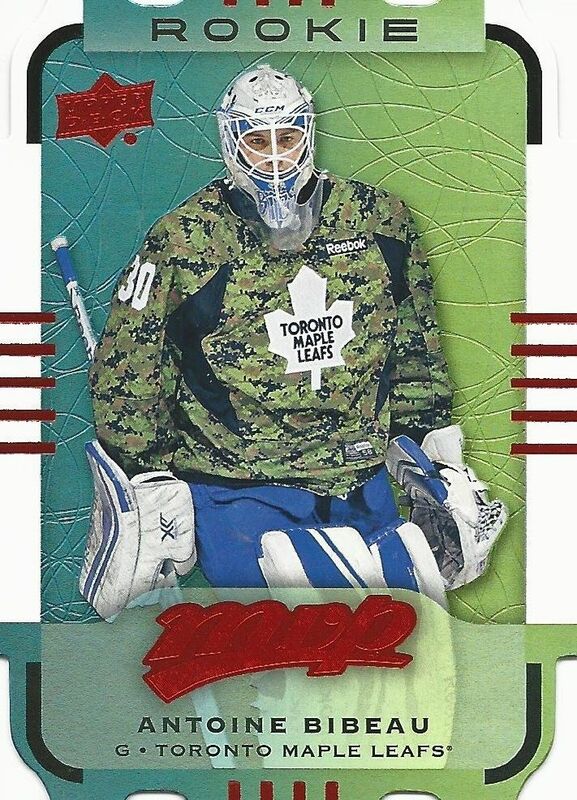 I had no idea that Upper Deck put printing plates into boxes for collectors to find. It's a nice card to have, and definitely a rare find, but like Super Scripts, printing plates have cooled in terms of collector interest. Though I didn't get a memorabilia or autographed hit, I did pull the plate. I think most boxes will yield a jersey or auto typically. 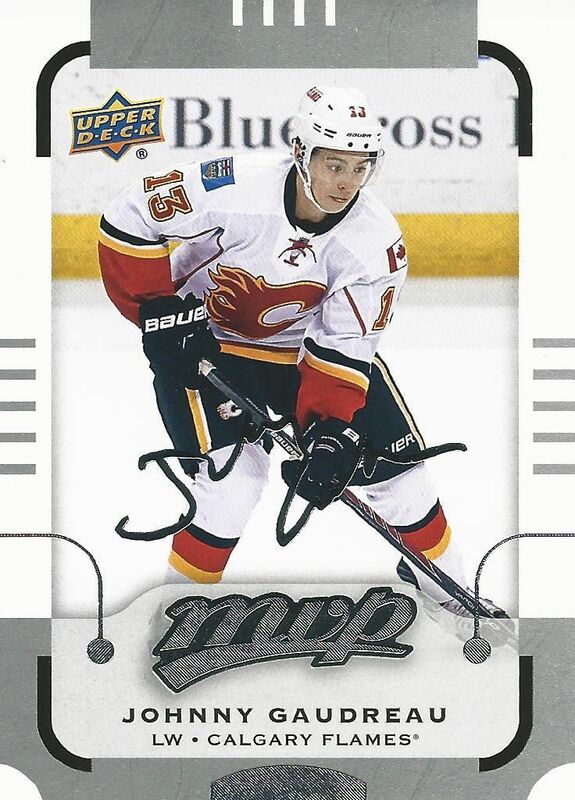 Collectors can also find rookie redemption cards for the rookies that have not skated yet this year. The most sought after redemption will be the Connon McDavid #1 Draft Pick card. The other redemption come in sets categorized by division. MVP has made some small, but nice, improvements in its second year back as a stand alone brand. The NHL Territories insert set is one of my favorite additions, and it's particularly nice that there are jersey and autographed versions to compliment the standard cards. Having rookie redemption cards within the set also makes this year's MVP an exciting buy. The chance to get Connon McDavid cards is a huge draw and will help MVP have a nice start. MVP will be one of the more affordable products this year, but Upper Deck has loaded it up with a nice array of cards to find. It's a fun break, and one that I definitely would recommend for its nice price point. Nice break! I really like the icy blue color of the rookie cards. Nice break the base is way nicer than last year. Nice box!! I like the look of the rookie cards and how distinguished they are from the base cards! Also the territories cards have a nice look to them, with the city in the background!! The one of one was very cool. You don't get a lot from what you pay for. I think it's awesome how they distinguisehed the rookie cards form the base cards. Nice box. The Printing Plate is a nice bonus to get! The Territories card look really nice! Nice break! I like this years set way better than last years! The die cuts are awesome! I personally am not really a big fan of MVP, as there are rarely hits. I don't like the aspect of $50 for possibly a jersey or an auto + a bunch of inserts. However the Printing plate was a very nice surprise! Overall, I would personally would give the product a 6.5/10 or 7/10 rating. Thanks! P.S. Sweet dance moves!! I love the intros! Nice box, not bad for the price. Will probably pick up a few pack to get one of the territories inserts. I'm not a huge fan of MVP but I really like the look of the parallels! Also that printing plate was a great bonus and a very nice card! Omg you are lucky! You pull tree sick card(Giroux, Lecavalier and Bibeau) in a cheap products. You should make the intro in every video. I nice to see your Yt evolving. Nice box. MVP is way better than last year. Base are better and you csnd distinguish rookies from base. NHL territories is way better than three stars. Each MVP hobby box has a guaranteed "big hit". 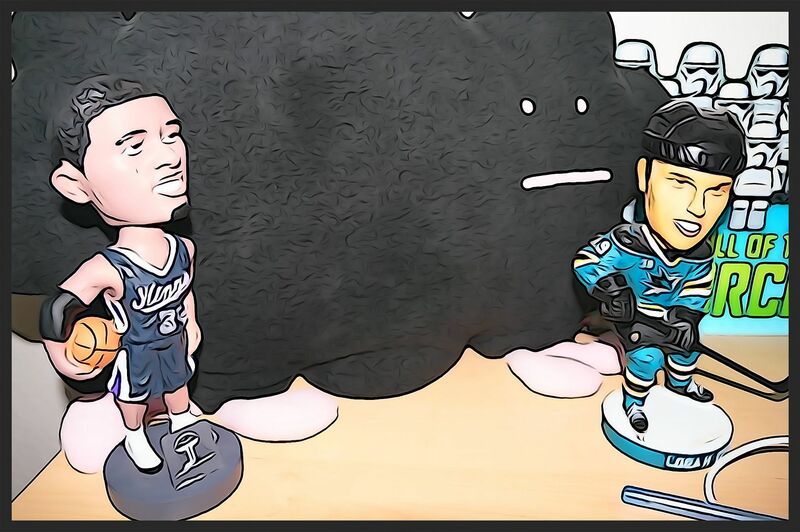 I think it was the Vincent Lecavalier. Thanks for the review! Nice review of 15-16 MVP. Looks like the Vinny Lecavalier printing plate was your box hit. The design is very MVP-like, which has their pros and cons. Thanks for sharing your thoughts with us Luke! + It's cool that you can find hits like printing plates and lower numbered cards. + The colours & contours cards look good, and it's a nice touch that some of them are more shortprinted than others. - I'm not a fan of the base design at all. The gold colour do not look good without any kind of foil on it. It feels more like a promo set or something like that. Why should I pay more for a product like MVP? I think the NHL Territories insert looks nice. Some nice cards here but everyone will buy MVP to try and get the McDavid redemption card. Nice vid thanks! I pulled a Crosby Printing Plate.